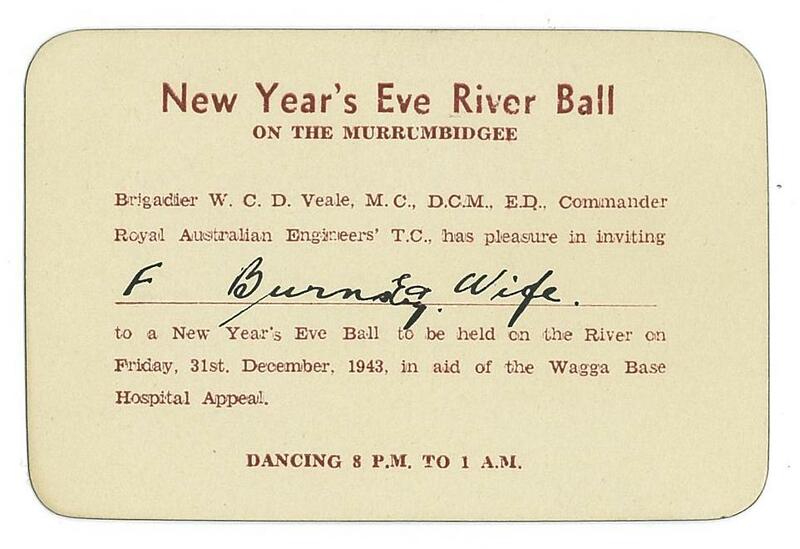 to a New Year's Eve Ball held at the Dixieland dance venue on the Murrumbidgee River in 1943, was held to help raise funds for the Wagga Base Hospital. Many social and fundraising events were held during wartime, including dances, social evenings, Christmas parties for children, civic receptions, dinner nights, swimming and sports carnivals. Compared to the present day, people were more socially active in many different ways during world war two. The Dixieland was a floating dance floor on the river , near the end of what is now Sturt Street, according to Wagga Wagga : a history, by Sherry Morris. Supper was served during the evening and the dance floor was decorated with colored lights and willow boughs, reminiscent of a fairy bower. 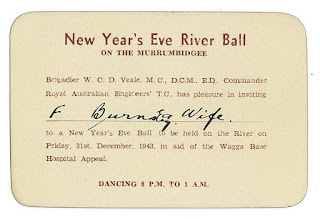 Wagga Wagga City Library has a small collection of invitation (and similar) cards, the earliest so far found an entry ticket to a special "enclosure" near the Soldiers Memorial Obelisk in Baylis Street, 1929. Floating dance floor. Love it. How many would end up in the river if they did it now.